Sale Grammar School is committed to life-long learning through the arts.Through active involvement in community based initiatives we aim to raise students' awareness of social and cultural diversity and encourage them to become more thoughtful and responsible citizens.During the school year, numerous community projects are undertaken in conjunction with the school's Art Department. We invite you to read through a selection of these projects below. 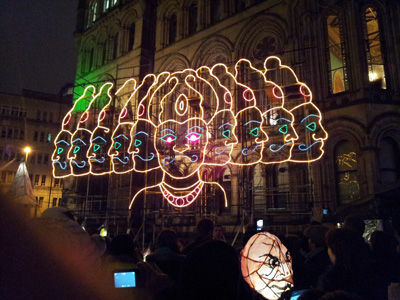 Selected Year 7 students worked with artist Emily Pitts (www.emilypitts.com) as part of our long standing relationship with The Indian Association (www.indianassociation.org.uk), in creating beautiful lanterns for the Manchester Diwali celebrations which took place in October at Albert Square. The lanterns were made from fabric and ribbons, and the procession of students and their lanterns lit the route for larger lanterns which told the story of Rama and Sita. For many years students in Year 7 and 8 have supported The Indian Association through participating in The Manchester Day Parade. Students worked with the prestigious company 'Walk The Plank' on contributions to The Indian Association's float and in learning contemporary Indian dance moves before participating in the parade that took place in central Manchester in June. Sale Grammar and Brentwood School have teamed up for an art project with a twist. Brentwood provides specialist education for pupils with severe learning difficulties, profound and multiple learning difficulties and autistic spectrum disorders. The project is an annual event, which takes place every summer term. 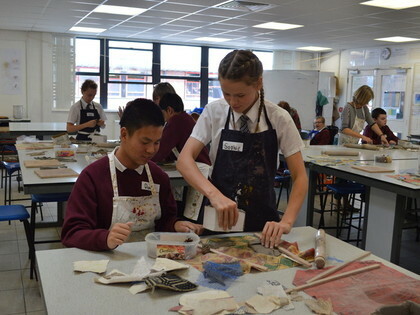 Brentwood students and students from Sale Grammar School year 8 teamed up together to make clay boxes. It was a collaborative scheme and the final product was excellent, showing teamwork and their artistic skills. Art teacher Mrs Howarth commented "This is an event that I always look forward to. It never ceases to amaze me how patient and caring our students are".